The HTC U11 Life runs vanilla Android Oreo. 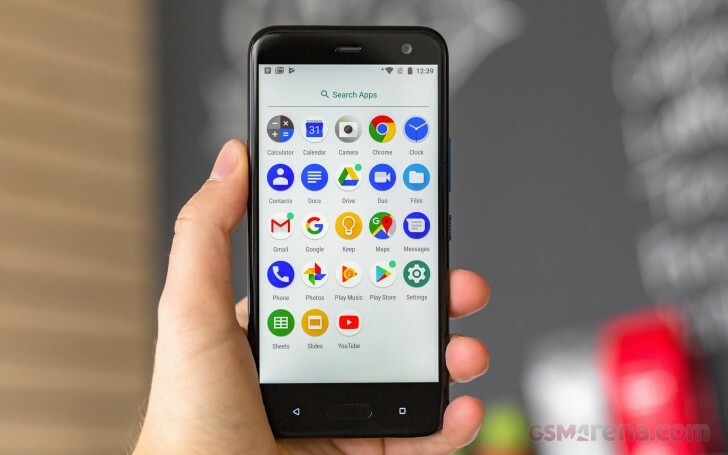 Google has promised at least two major updates for the Android One phone, so the U11 Life should enjoy Android P and R, plus regular security patches. Everything but the camera and the squeeze gestures is handled by the stock Google app suite and while this approach may not be everyone's favorite, it does come with two indisputable benefits: fast-track updates and a lighter, nimbler UI. The lockscreen displays the standard notification cards, complete with grouping, expanded view and direct reply. There's a camera shortcut too. The Ambient display is available on the U11 Life. It lights up whenever you get a new notification or when you pick up your phone, provided that you have enabled one or both of those functions in Settings. It shows the clock and events that might require your attention. The Pixel-like app drawer that you pull up from the dock is your only option. Of course, since there is folder support on the homescreen as well, you can organize everything there and simply forget that the Pixel-like swipe-up even exists. The homescreen setting menu only has a couple of options but both are interesting. The Google App toggle is used to enable or disable the Google Now interface, accessible via a swipe to the right form the homescreen. There's Google Assistant too - the customary long press on the Home button summons it. A single pull on U11 Life's notification shade gets you six small toggles. Pull a second time and you get a total of 9 large ones per screen, with multiple panes supported. There's also a brightness slider, but Auto brightness is only accessible through the settings menu. The task switcher is business as usual, the Android rolodex layout. The 'clear all' button only appears when you scroll all the way to the top - a bit of a nuisance. There is multi-window multitasking, but the screen is always split 50/50 - you can't adjust the window size. The Android OS might be vanilla but has the same Edge Sense support as the rest of the U11 series. The sides of the phone are lined with pressure sensors and this lets you program two gestures to open whatever app you'd like. One that may be particularly useful is the Camera app, though, you can achieve the same result by double-pressing the power key and using the volume rocker to take the picture. The first time you squeeze the phone, you'll be prompted to set up the Edge Sense feature. You'll follow a tutorial that shows you how long and how hard you're squeezing with on-screen visuals to guide you. Note that your ability to squeeze may be affected by the kind of case you use, so keep that in mind if shopping for one. Advanced mode is where you can program two gestures. The default gestures are: short squeeze opens camera, a second squeeze takes the photo. It's worth noting the UI purposely has a delay built into it as to wait for you to stabilize the camera before taking a shot. That way, the phone isn't shaking mid-shot. The other default action is a squeeze and hold that will activate the phone's default assistant - Google's or Amazon Alexa. Doing the same thing while the keyboard is open will activate voice-to-text typing. And here comes the best part - you can configure the gesture behavior for the UI, and in-app for each installed app. Globally, you can set a long or short squeeze to launch the Edge Launcher, which is a two-step dialer popping on the screen, which can replace your entire app drawer. There is also a calendar around, which is nice. You can set the gestures to work differently for each of your apps. For example, you can set a short squeeze to take a screenshot in your favorite game. 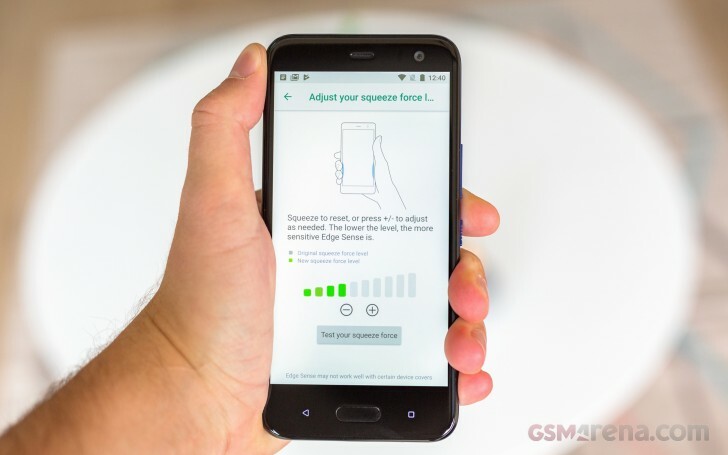 There are so many different configurations you can opt for with the squeeze detection unlike the Pixel 2 XL. HTC gave you the freedom to make the U11+ yours and the tools to do it.